Joshua moved into his big boy cot! We bought the Sundvik cot for him as well as an Eve mattress. I cried, obviously because we had to pack up the Snuzpod. The newborn days are over. Easter Sunday was spent with family eating a delicious lamb roast before tucking away an Easter egg or two. I couldn't resist making Joshua my very own Easter bunny. He's gonna hate me when I get this out at his 18th birthday party. Lydia Elise Millen released her collaboration with Elizabeth Arden and I rushed to get mine. I had a couple of issues but Elizabeth Arden delivered a brand new one when my first one was broken. I haven't stopped using it. Joshua and I had a lunch date with my best friend where I was finally able to get my hands on my first Aperol Spritz. Aisling and Beth came down from London to visit for the day. We all started our blogs around the same time, have been meaning to meet for the longest time and we finally made it a reality. Joshua turned six months old this month, I cried, again and then remembered he's growing into the most amazing little boy and that we're very lucky. Holly came down from Brighton for the day and she took this photo which I love. We spent the day eating brunch, lazing in the sunshine and drinking stupidly expensive, disgusting mocktails. Arran and I tried out the new Vegan menu at The Real Greek and squeezed in a little date night in the process! Greek food is my favourite and we spend a lot of time there. How did your April look? Ahh what a lovely month with so many special moments! Joshua as the Easter Bunny is AMAZING! We've got a The Real Greek near us and I've been desperate to go ever since you mentioned it! I am so glad you got a new EA Lydia bag, I cannot actually believe they made it your problem! I so love seeing your months, and see little Joshua grow so much! Your IG is a joy to scroll through! I love these posts. I can’t get over how Joshua is growing so fast! Awww April sounded lovely for you! Joshua is adorable! 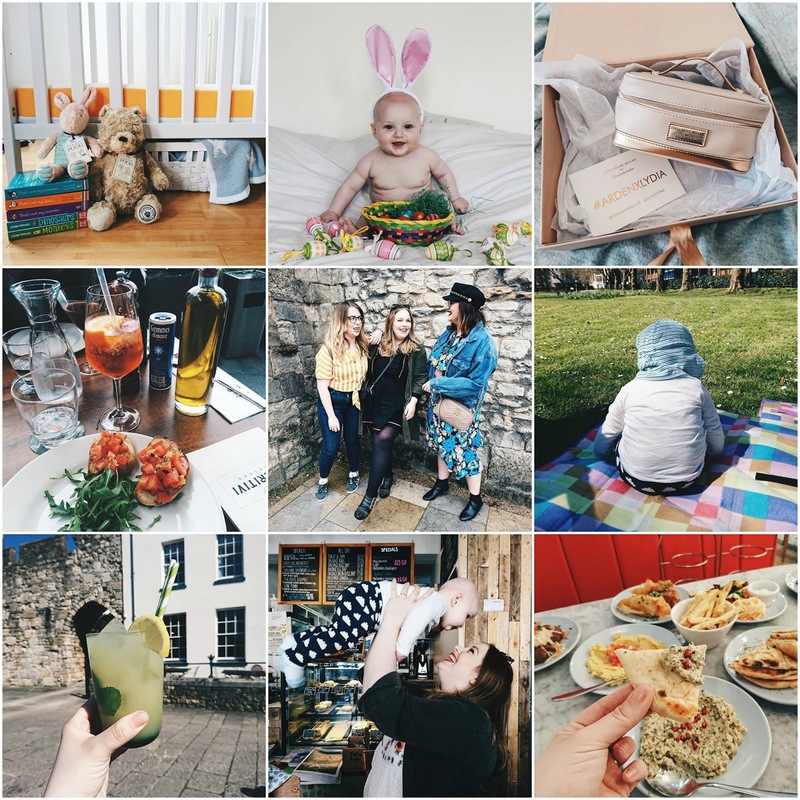 Sounds like you had a pretty amazing month, my April seems to have been full of trying new products and finding confidence in front of the camera. Looks like April was a pretty epic month for you!